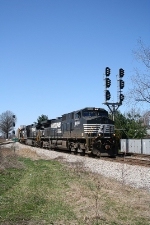 Description: A pair of D9-40CWs sandwich a SD70M with a westbound intermodal train. The last train of our trip. Description: 24Z works east towards CP Rade as it passes the former Westmoreland Glass Co. Description: NS D9-40CW 9588 leads an eastbound stack train over Rockville Bridge. Description: Exchange st and Fremont Park one early fall afternoon, date approximate. Description: Like most trains, this NS freight turns off the Cleveland Line for the trip to Pittsburgh and points east. Description: Hauling 2 depressed-center flatcars loaded with generators. Description: Westbound on track one passing underneath the MP 98 signal bridge at Derry St. Description: NS 280 or 288 not sure heads over to the Mixing Center seen at Town st. Description: A southbound NS empty hopper train approaches the CSX diamonds at Marion. Description: JMU's new parking deck is also an observation deck!